We arrived in Civitavecchia, the Old City, the ancient port of Rome. Some of our guests will leave here, and we wish them safe travels. To guests just joining us, welcome aboard. And for those who have been with us since Monte Carlo, prepare for a change of view: from elegant or gaudy modernity to classic Greek, Roman, and Ottoman culture and history. Add to the mix the Venetians and the Crusaders. We are sailing first to Sorrento, from where we can see Mount Vesuvius and the ruins of Pompeii and Herculaneum in one direction and the lovely island of Capri in the other. There is so much to see and do here: add to the mix Naples to the north, the Amalfi Drive to the south. And for the adventurous: Paestum. Continuing down the coast we arrive at Trapani on Sicily, the largest island of the Mediterranean. And then Valletta on much smaller Malta; smaller but of unmeasurable fascination. We round the corner and head to two of the best-known of the Greek Isles: Mykonos and Santorini. The first a pleasant place of windmills and beaches. The second, a handsome setting atop a ticking time bomb, the site of one of the largest volcanic explosions of our planet. And then Kusadasi, a Turkish delight and gateway to the spectacular ruins of Ephesus. Once a seaport and an important Greek and then Roman holy site, it became one of the foundational churches of early Christianity. We end with a passage through the Dardanelles, alongside the trenches of Gallipoli, one of the most horrific killing fields of World War I, and then arrive at Istanbul. 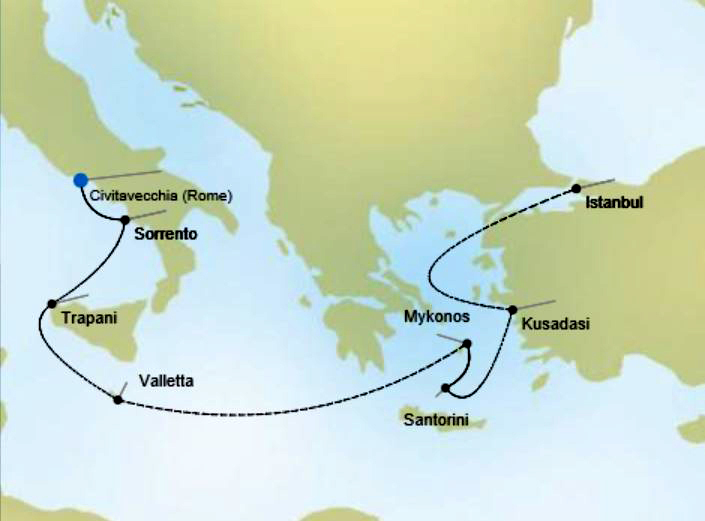 I’ve sailed this itinerary many times and happily do it again; it is like floating through a course in ancient history…done in fine style.